At the School of Health and Social Care we go beyond the theory. Our graduates develop the professional knowledge, critical thinking and industry connections to truly make a difference. We aim to have an enduring global impact on society through the positive influence of our professional and ambitious graduates. 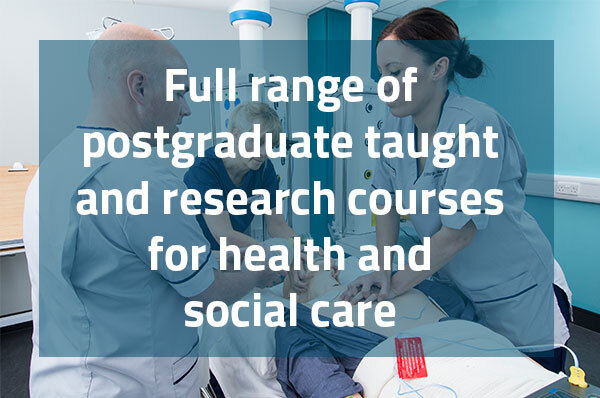 The School of Health & Social Care provides a vibrant teaching and research environment for over 3,400 students and 130 staff. We deliver a world class learning experience and undertake pioneering research with a focus on practical and applied results. The health and social care sector is one of the most rapidly changing and high profile sectors. Policy changes alongside financial challenges are putting greater demands on staff in terms of knowledge, skills and qualifications. Our nursing and midwifery graduates qualify with official Nursing and Midwifery Council (NMC) registration. 99.4% of our nursing students go straight into work within six months of graduating, and they go prepared with both the skills they need to provide great care and a fantastic work ethic. Why study a health course with us? The changing focus of the health and care sector onto patient-centred care, greater choice and control for service users, and awareness of the importance of healthy lifestyles have increased the demand for well-trained and multi-skilled people in a wide range of rewarding roles. 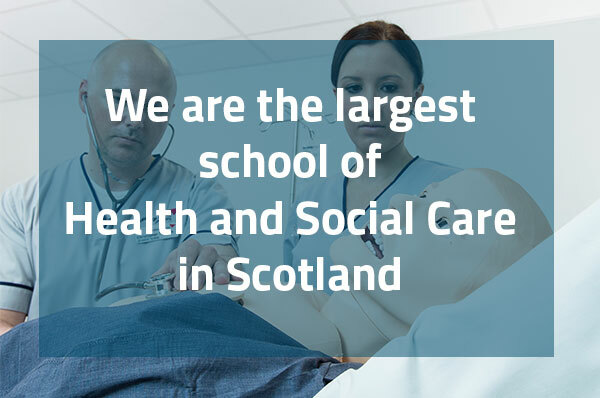 A qualification from Edinburgh Napier University’s School of Health and Social Care will ensure you are equipped to meet these priorities. Embedded in all our courses is a strong emphasis on working across professional boundaries – with clients, service users and patients placed firmly at the centre. We offer an exciting range of undergraduate and postgraduate courses in health and social care to enable you to meet the demands of employers in this diverse sector as soon as you've graduated. With our degrees in pre-registration nursing professionally accredited by the Nursing & Midwifery Council (NMC) as a nursing graduate you will qualify with official Nursing and Midwifery Council (NMC) registration. We were named Nurse Education Provider of the Year (pre-registration) for our learning disability nursing programme at the 2017 Student Nursing Times Awards - a major honour. Our dedicated staff pride themselves on their commitment to supporting students, providing students with the skills and knowledge that ensure that they are multi-skilled and able to contribute to a wide range of professional roles. Our students have the opportunity to experience a wide range of practical based work, including placements. Our established research profile combined with our active links with a wide range of organisations ensure that our teaching meets the needs of employers and our research responds to the rapidly changing environment and technological advances. Staff in the School of Health and Social Care are nationally - and internationally - recognised for their research. With an established research profile, our research attracts funding from government bodies, UK research funders and charities. This is complemented with a large portfolio of research and consultancy work with local, national and international organisations.